Over the last few years, online retailing has shown remarkable growth. According to Goldman Sachs, global ecommerce sales went from merely $572.5 billion in 2010 to almost $1.2 trillion in 2013. Watching these trends, some retailers have chosen to operate exclusively through online channels. These businesses have seen about 9% yearly growths according to WWW Metrics, an internet business statistics company. In comparison, traditional brick and mortar (B&M) retailers that have incorporated online sales channels have reported an average of 23% growth. These statistics show companies’ online channels are no longer an experiment but a vital and growing part of their business. Marketing & Promotion– Create marketing programs such as catalogs and flyers, while giving you the ability to better organize your catalog content for online use and offline use. Multi-Store-Manage & control data from more than one store, making it possible to update all inventory, sales and pricing information accurately. Order Management System – Eliminate manual order entry, streamline your Order processing and update customers about their order status (improving customer experience) by eliminating operational inefficiencies from the existing process. Complete Social Experience –Social media is another way to connect with customers and business partners. Your customers can make purchases from the same places they connect with others and easily share those purchases. 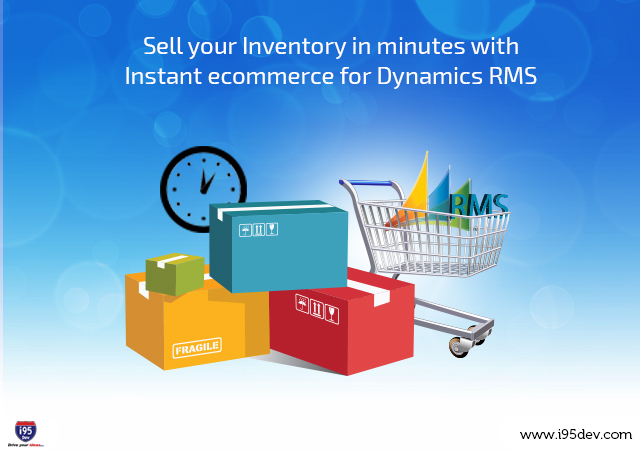 For more information on instant ecommerce for dynamics RMS feels free to contact us at http://www.i95dev.com/contact/ or give us a call at 301.760.7499. We would be more than happy to serve you and help with our expertise to boost your business.